Chirinkotan volcano is a large, mostly submerged stratovolcano forming a small largely unvegetated and 3 km wide island in the Kuril Island chain. It is located at the far end of an E-W-trending volcanic chain that extends nearly 50 km west of the central part of the main Kuril Islands arc. The volcano is one of the Kurile's most active. Historical eruptions included lava flows on the SE flank during an eruption in the 1880s and were observed by the English fur trader Captain Snow. Some activity is occurring at the volcano. 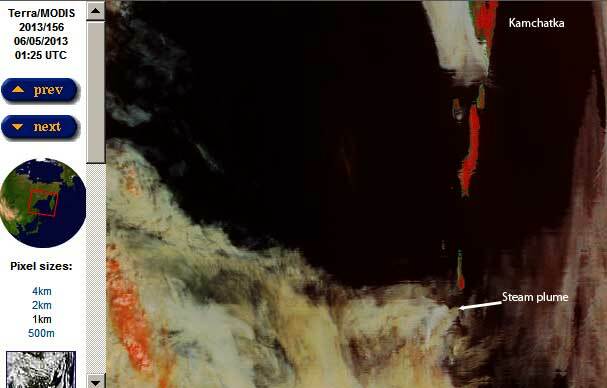 On MODIS Terra satellite images from 5 June, a moderately large steam plume can be seen drifting from the volcano. SVERT has raised the alert level to yellow on 8 June.